Near Chiang Mai there’s an important temple known as Doi Suthep. It’s reached from a mountain highway and a funicular which rises several hundred meters to the level of the temple. Here, near the top of a golden spire, in a glass and gold reliquary, lies a splinter of Buddha’s leg-bone. 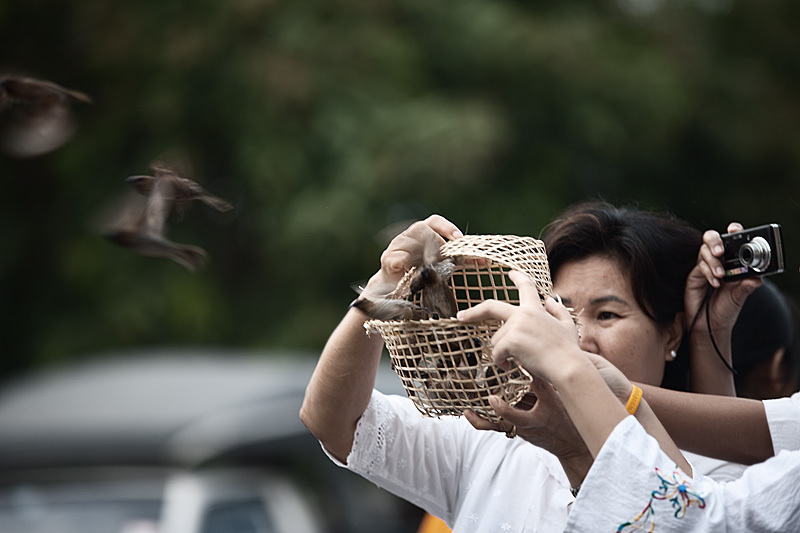 Before ascending the funicular I purchase for forty baht a small cage containing four finches — active and eager to be free. When I arrive at the top I release the birds — they buzz off in all directions. Within a minute a bird of the same species lands on my head. The bird stays with me as I proceed around the temple. It’s under my collar, into my hair. When I unfold my French easel it sits on the top of the canvas and makes a contribution to my palette. I realize my small friend is a seasoned professional in the free-the-bird business. Beautifully dressed children holding lotus blossoms are slowly circling the temple. In the late sunlight it’s an opportunity for a Sorolla-like vignette. I try to grab the essentials of the procession: simplify shapes, one in focus, others less so. Light through the material will come later — after glazing. For the time being I use a system I call “overshoot and cut in.” It’s magic in acrylic. The faces, arms and hands are a warm and oversize smudge. They are then cut in with the dark negative shapes of the background around the faces and the light negative shapes of their robes around the arms and hands. My little spirit rocks back and forth with the action of the brush on the canvas. My little spirit is not inclined to interfere with my painting. My little spirit just stays and stays. I have the curious thought that we’re being with each other because we want to be. A woman comes around. She has a big cage with many birds in it. She looks at my painting and then helps herself to my bird. I say, “Thanks for the loan of the spirit.” I’m not sure she understands. Your story of “freeing the spirits” recalls one of my most magical painting weeks that I experienced last year. Having come through an exhausting series of emotional times, I retreated to my studio at Lake Okanagan. In that sparkling early spring, with bird song cascading from a deep blue sky and breezes whispering through golden green leaves, I took my easel outside. I was staying alone, the summer neighbors nowhere in evidence, nor did the human sounds of hammers, boat motors and radios disrupt the rhythm of nature. In those magic filled days, a deer came to lie in the golden remnants of last year’s grasses at the end of the deck, and a little red headed finch regularly flew over to perch on my easel, cocking his head to watch me when I stepped back to assess my work. My paintings flowed from my muse and created marvelous canvases and I felt healed and joyous. It is memories like those which will help if dark days return again. What you’re talking about here is a mascot. It is the concept of having a small dog as a courage-giving spirit to a flight squadron, a parrot on a sailing ship, or even a chromium goose on the radiator cap of a car. The chosen animal empowers the unit it oversees. Your gentle, freedom-loving but complicit finch was invested with that power. For several days now I have had a flag flying proudly from the top of my canvas. It’s a constant reminder of the value of freedom — freedom from fear, poverty, hunger, tyrannical religion, and all forms of unjust oppression, aggression and terrorism. It’s really not meant as a nationalistic statement, but rather the hope in the eventual dominance of good in the human spirit. The flag I’m flying is the tricolor of Afghanistan. My life takes me to Germany quite a lot (from the UK), and I have been fortunate enough to have lived in both Germany and the USA working in the car industry. I have also been lucky enough to have traveled in Korea and Japan. Thundering south on a bullet train from Tokyo to Hiroshima, passing endless miles of ‘habitation’ (by humans) is an unbelievable sight. Then the return journey in the evening of the following day, and seeing the neon Christian crosses burning in the suburbs, a reminder that Buddha does not have every soul. There is something very tranquil about these massive timber Buddhist temples that is reflected in your latest ‘escape.’ Travel is the one great ‘leveler’ of society! It certainly humbles me to appreciate how lucky I am in this little world of ours. People of all cultures have frequently believed in the value of an accompanying talisman or amulet which gives enhanced insight or even guidance to the activity at hand. Whether in the form of a crystal, lodestone, tinkling bell or dicky-bird—the value must exist in the mind of the owner. This culturated habit which has arisen from our anthropomorphic past, when our ancestors found power even in stones. These animistic states of mind continue to attack us, woolify our brains, and have little to do with the production of quality work. Once when we were sailing to Bermuda — out in the middle of the Atlantic with no land anywhere — a tiny sparrow flew onto our boat and landed on the toe of my shoe. He (she?) rested there for around a half-hour. I was amazed, and kept my foot quite still. When the bird flew off, I remained amazed at the connectivity of beings far from shore. Since the King put a moratorium on logging in Thailand several years ago, thousands of working elephants have become unemployed and been reduced to working for tourists or even begging in the streets (their mahout has bananas and you buy them and can then give them to the elephant.) It’s extremely sad. “There were buckets of frogs in the marketplace. I watched as women skinned them alive, then severed their legs from their bodies to sell. With eyes bulging, the still living naked torso was thrown into a separate pail to be discarded. I want to register 10 of my paintings with the US copyright offices. I have downloaded everything from their web site, but there is so much info that is not relevant to visual artists that it’s hard to understand. My question is this, I have heard that it is possible to register 10 paintings with 1 application and pay 1 fee. Is this true and how do I do it? You may be interested to know that artists from every state in the USA, every province in Canada, and at least 95 countries worldwide, have visited these pages since January 1, 2001.